6 weeks ago I posted an article about using TRIP to identify content suitable for resource poor settings click here. Problem: A clear problem for resource poor settings is identifying high quality evidence upon which to base clinical decisions. Within TRIP, content suitable for these environments, is frequently ‘hidden’ by the volume of material aimed at resource rich environments, making the identification of appropriate evidence difficult. This problem is not restricted to TRIP: there is no way in Medline (or other databases) to select material suitable for resource poor settings. Proposal: We propose that users of TRIP would be allowed to ‘tag’ (by pressing a single button) an article if it is suitable for resource poor settings. A user coming to TRIP could then carry out a search and decide if they want to restrict the results to just those tagged as being suitable for resource poor settings. Quality is an important issue, therefore, we propose a quality system whereby an article would be considered ‘pending’ until it has been selected at least two further times. If a user restricts any subsequent search a pending article would be clearly marked as such. Thumbnails improved. Previously we re-sized all the images ‘on the fly’ which caused all sorts of rendering problems, they tended to look awful. We’re now grabbing the content from the web, re-sizing at our leisure which allows us to significantly enhance the thumbnail quality. Quantity. Due to our spidering tool improvements we’ve gone from around 40-50,000 images to over 90,000 with a hope to take the figure to over 100,000 before the end of the year. 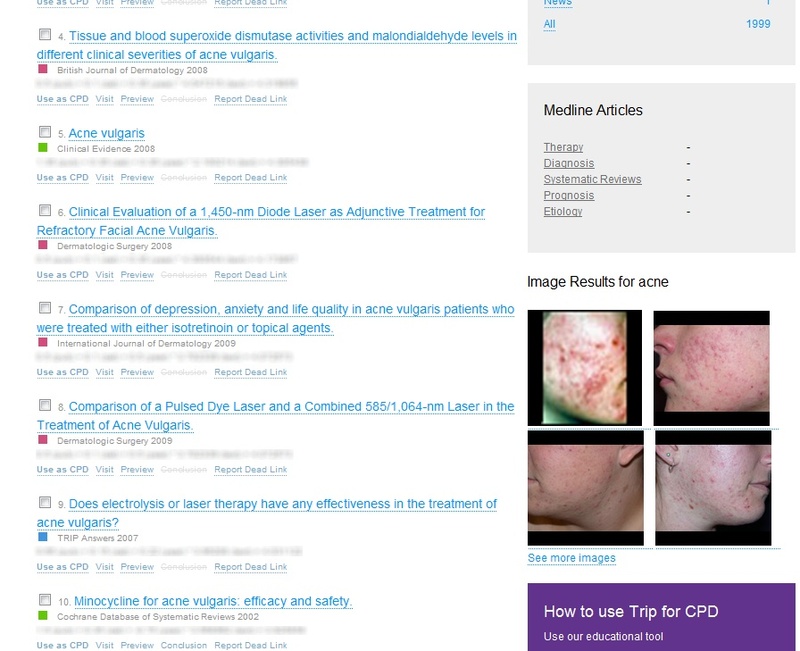 In addition we’ll also auto-search google images and add those to the main medical image results display. Display. We’ll start showing 4 thumbnail images on the main results page of TRIP, see below for how it’ll look. 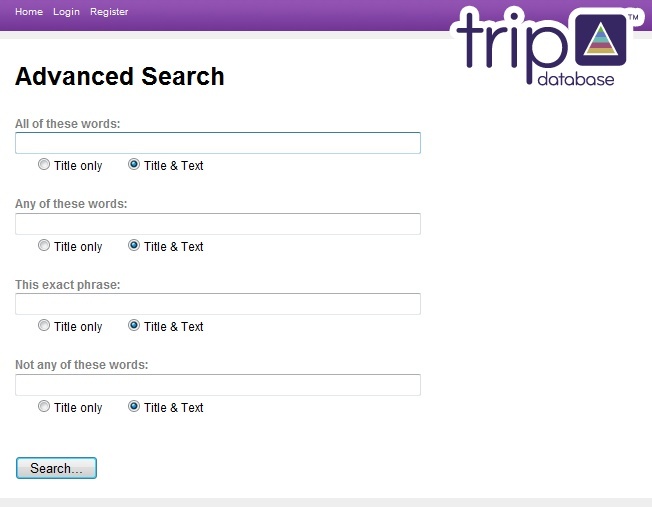 The advanced search on TRIP has been a problem for years. We’ve spent many hours fixing it, only for it to develop further problems. In our current overhaul we’ve taken a fresh look at the advanced search and significantly changed the way it works. For a sneak preview see below (click on image to make it bigger) – you’ll also see our new logo! I had my initial look at the work on Tuesday and the points raised have now been addressed, so we have a few days of additional internal testing. Early next week we will be carrying out some independent usability testing using Minervation. This involves a number of volunteers looking at the new site and being asked to perform a number of tasks. The volunteers will be videoed while performing the tasks and this will be analysed (alongside a post-test questionnaire) to highlight possible weaknesses in the design. Once alterations have been made based on the above steps we’ll throw the site open to the members of the TRIP Advisory Board. This should last two weeks, giving longer-term usage feedback. The above represents the most robust testing that we’ve ever undertaken. It should be worth it and we should be able to launch early September. While researching a question on oral contraceptives and low BMI I came across a significant number of links to the FSRH clinical enquiries that were leading to ‘file not found’. Due to their set-up they delete files from their servers after about 3 years old. TRIP does not access the files dynamically so ‘dead’ links aren’t removed and people get poor results. Therefore, I’ve manually updated the records, removing 500 (around 30%) of the records. The issue of longevity of Q&As is problematic and there are no obvious right answers. On TRIP Answers we leave all our answers on the web, but mark when the record is over two years old. We also allow users to comment if they feel something is out of date (or if new research appears) – and this will be further enhanced in the near future. Finally, we will be rolling-out a semi-automatic system to keep records up to date towards the end of the year. I strongly believe that Q&As (arising from genuine clinical situations) are the most powerful form of evidence. They are nuggets of evidence that clinicians can directly apply to their practice. So, I hate to lose Q&As – they’re too useful. Be transparent, warn people when they’re ‘old’ and let the user always be sceptical.